I hope everyone had a wonderful 4th of July. I had a pretty relaxing weekend. After working for 5hours on Saturday, I went on a double date with my hubby and my parents to DC ; we had lots of fun. On Sunday, after church, I went to shoot some photos then grabbed something to eat at "La Madeline". The rest of the day was spent watching movies with my hubby. Monday was all about food, more food, then some browsing, blogging, shopping before watching fireworks from my stairs. What did you do over the weekend? Hi Stella! I'm a new follower of yours and I'm already addicted to your style. The yellow and the blue is so cute and vibrant on you! Love it! absolutely fab shoes! love your outfit! follow you.xoxooo .i am too Stella. OMG I love your look !!! Amazing !!! You are beautiful ! whoa! I should totally fly to where you at and raid your wardrobe! girl I love this! Ooh I looovee those wedges!! You have a fabulous style! Love everything... colors are just so awesome! what a gorgeous shade of blue on the shoes. i love the white top. 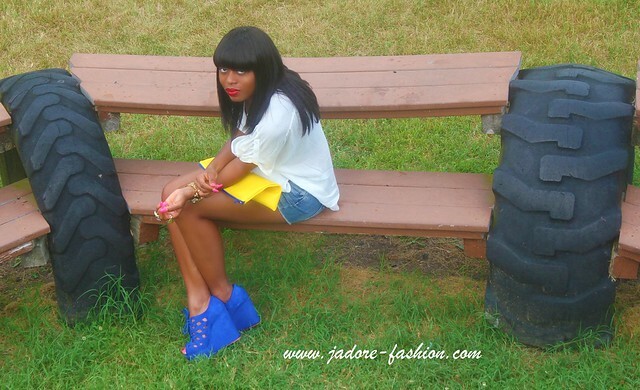 you look fab those shoes are amazing and love the bold colors! amazing, love it, your pretty shoes . Love this look, especially your new shoes! LOVE those shoes. They are just awesome. Love your blog header too. Found you on IFB and am following. I just adore your sense of style. Work it girl. Great color blocking doll. Love the combination of such bright colors and those wedges are just fabulous.